I'm mad and I gotta get this off my chest. 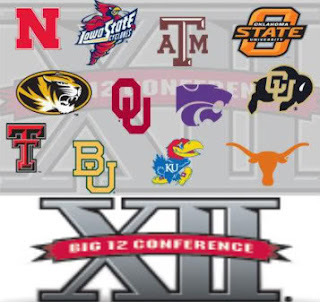 After 103 years, the schools of The Big 12 conference (formerly known as the Big 8) are getting a divorce and those of us who graduated from these schools are like the proverbial kids caught up in our parents' inconsiderate mess. Now it's true that the Big 12 conference itself is only 14 years old, but the Big 8 dates back to the early 1900's. It is basically made up of the MidWest states of Colorado, Kansas, Missouri, Nebraska, Iowa and Oklahoma. In 1996, they added Texas to the conference, which geographically made sense since it borders Oklahoma to the south. This conference is was home to the second oldest rivalry in NCAA history - the Kansas-Missouri Rivalry. For those of you who don't know, the KU-MU rivalry is an extension of the historical rivalry between these two states since the Kansas-Nebraska Act of 1854 which brought Kansas in as a Free State right next to its neighbor, Missouri, which was a Slavery State. The two states have have been fighting ever since. That rich tradition, along with the other rich traditions of the Big 12, have now been abandoned for the sake of money and greed. So what happened? In a nutshell, certain schools (Missouri, Nebraska, and Colorado) felt they weren't making enough money being a part of the Big 12 conference. And truth be told, there was more money out there in some of the other conferences, to be sure. There have been talks about Missouri and Nebraska defecting to another conference for quite some time now, but most people discounted them as mere rumors and hearsay given the strong commitment to the Big 12 by its member schools. But after the Big East expanded not too long ago, suddenly a realignment seemed possible. Today, at approximately 1pm CST, Colorado announced that it is officially leaving the Big 12 and joining the West Coast's Pac-10 Conference. That's right, folks, Colorado is now in a West Coast Conference. I don't know about you, but I've been to Colorado a few times, and nothing about it screams West Coast. But I digress. With the defection of Colorado, many speculate that Missouri and Nebraska are not far behind, both schools having been rumored to be heading to the Big 10 soon. So where does all this musical chair playing leave the rest of the Big 12 schools like Kansas and Kansas State? It's anybody's guess at this point. The only thing that is certain is that the Big 12 Conference that we've all come to know and love is no more. As a kid who grew up in the Big 12 where college sports is a big f-ing deal, all I can tell you is that this is a sad day in college sports history. Hope the money was worth it.